Some four miles to the west of Rhiw, on the minor road out of Aberdaron towards Anelog, on a cross roads, we find another remnant of the pilgrim trail, another Ffynnon Saint or the Saints’ Well. This has little to mark itself out as special other than its name. In recent years a name board has been erected to mark the location, without which it might never be seen; though i suspect few stop here to find either sign or well. The sign board is in front of a small thicket of trees. 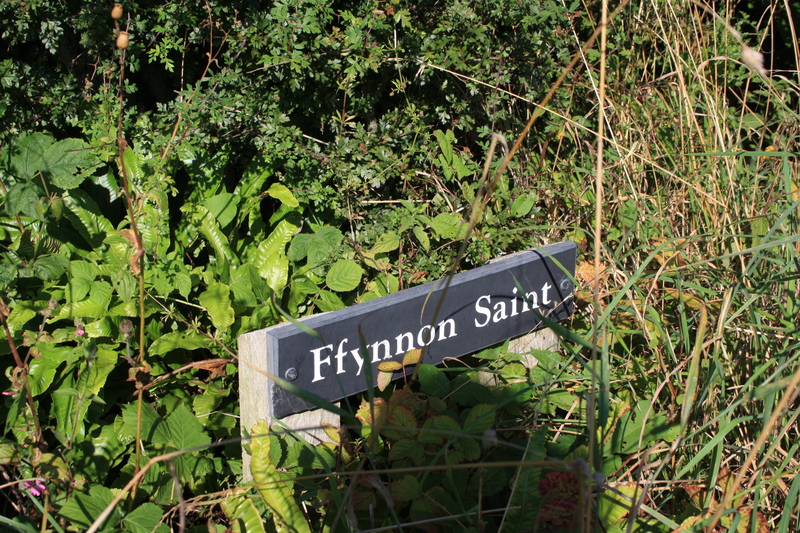 Once you push your way through, you find yourself in a small clearing close to a stream, and there, enclosed in brickwork, underneath a hinged metal lid, lies Ffynnon Saint. 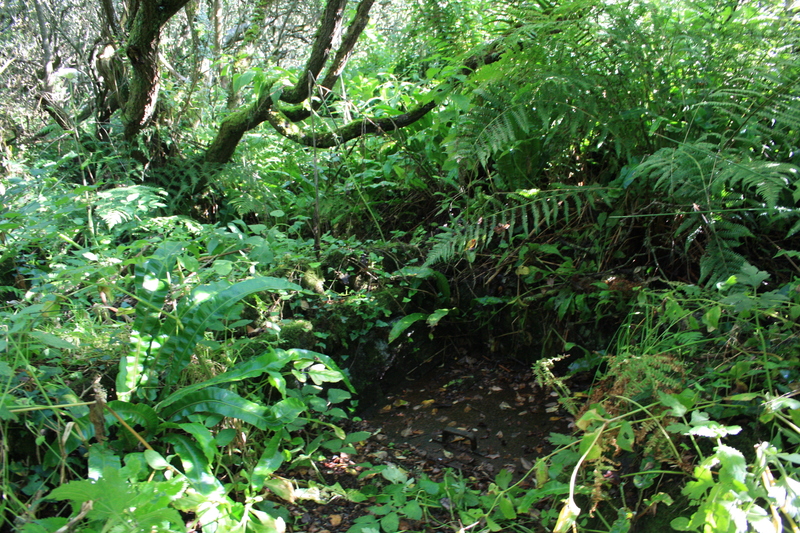 The stream itself is called Afon Saint, the Saints’ River reinforcing the one time importance of the area. Apparently the well was once enclosed with stones, though these have long since been removed and were used in the construction of a nearby bridge over the river. 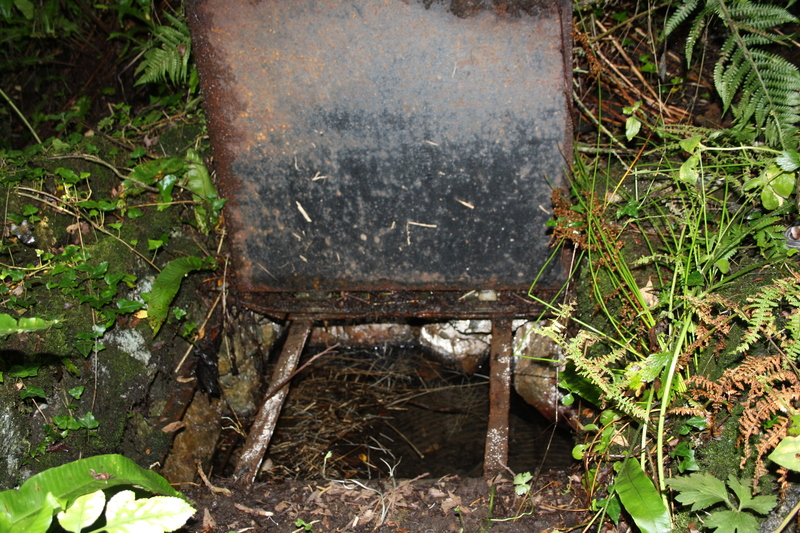 The well is a small D shaped pool about 3 feet across, surrounded with stone walling below water level and covered at ground level by a modern hinged iron lid. Around this, above ground level, is a dry-built stone wall about 1 foot high, surrounding the well on three sides and open to the west. The dry stone walling has since been removed and replaced with a hedge. Any particular customs or powers associated with the well have been lost in the mists of history. Myrddin Fardd records that it was known as a healing well, but its only surviving claim to fame is it links with the chain of pilgrim wells, the last stopping off point before you reach St Marys Church and well another mile or so down the road, before embarking for Bardsey. just wondering if it were possible to use an image of the well (slate plaque) for a digital walk we’re developing (free to public)?